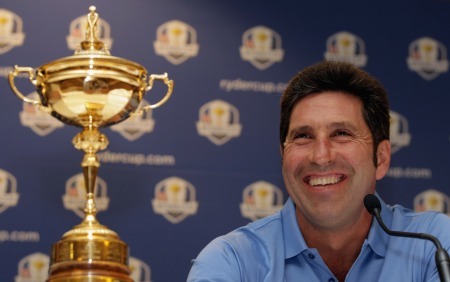 He will name the fourth when he announces his two wildcards on August 27 and while Miguel Angel Jimenez is likely to get the nod, there will be speculation that Padraig Harrington could still play a part at Medinah if he fails to get a pick. Björn, Clarke and McGinley have between them played in ten Ryder Cups and won nine, were on Colin Montgomerie’s backroom team when Europe regained the trophy at Celtic Manor in 2010. 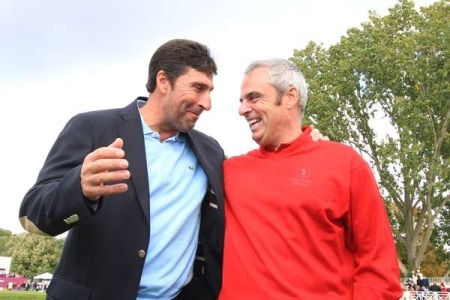 Olazábal said: “I could not be more delighted than to have Thomas, Darren and Paul as Vice Captains especially as we bonded so well supporting Colin Montgomerie in 2010. 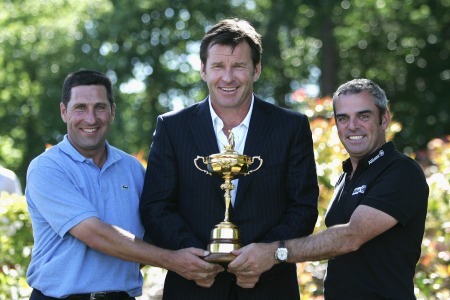 All three are world class golfers with tremendous experience of playing in The Ryder Cup which is absolutely invaluable. “For me to have these guys – all such great friends – by my side is fantastic. I know like me they will now be counting down the days to to Medinah with one aim – to return home with the Cup. “Thomas, Darren and Paul share a special spirit and love for the game and they have the respect and admiration of everyone in golf. Their passion, commitment and desire to win will encourage everyone in the team room and for me it is so important to have guys you know, guys you trust, guys familiar with this contest because The Ryder Cup is unique. “My own experiences as a Vice Captain in 2008 and 2010 taught me that you need a lot of help that week. You need eyes, extra eyes to follow the players in the practice rounds to gather as much information as you can about how everyone is playing. “Then it is important to have each match watched because you have to hand in your pairings for the afternoon matches when the players are still out on the course. That means it is essential to have all the information you can get before you put those pairings down on paper – my Vice Captains will make sure that is the case and I will name the fourth one at the August 27 Conference when I announce my two picks. Björn became, in 1997, the first Danish player to compete in The Ryder Cup and he was unbeaten in the Seve Ballesteros-captained winning European Team, and he was also on the winning team in 2002. He has played six matches, winning three and halving one. Björn was Vice Captain to Bernhard Langer in 2004 at Oakland Hills and to Colin Montgomerie at the Celtic Manor Resort in 2010 and he has also captained Continental Europe in the Vivendi Seve Trophy. He has 13 European Tour wins and in all 19 worldwide. Northern Ireland’s Clarke, winner of The 140th Open Championship last year, also, like Björn, made his Ryder Cup debut in 1997. He played five matches in succession, finishing on the winning side four times, and won ten and halved three of his 20 matches. Clarke was Vice Captain to Colin Montgomerie in 2010. He has 14 European Tour wins and in all 21 worldwide. Ireland’s McGinley famously holed the winning putt on his Ryder Cup debut in 2002 and he has an enviable 100 per cent winning record having also been on the winning team in 2004 and 2006. He won two and halved five of his nine matches. McGinley was Vice Captain in 2010 and he captained Great Britain and Ireland to victory against Continental Europe in both the 2009 and 2011 Vivendi Seve Trophy matches. McGinley has four European Tour wins and in all nine worldwide. The ten automatic qualifiers for The European Ryder Cup Team – five from the European Points List and five from the World Points List – will be confirmed on Sunday August 26. 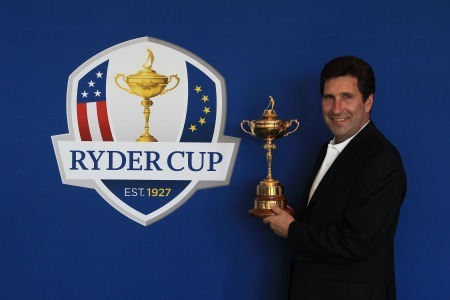 Olazábal will announce his two Captain’s Picks at a special 2012 Ryder Cup Conference at Noon on Monday, August 27, at The Gleneagles Hotel, Perthshire, Scotland. The eight automatic qualifiers for the United States Team became known following the conclusion of the US PGA Championship last Sunday. They are Keegan Bradley, Jason Dufner, Zach Johnson, Matt Kuchar, Phil Mickelson, Webb Simpson, Bubba Watson and Tiger Woods. United States Captain Davis Love III will announce his Captain’s Picks at the NASDAQ Marketsite, New York City, on Tuesday, September 4. Love has named Fred Couples, Mike Hulbert, Jeff Sluman and Scott Verplank as his four Vice Captains. Spain’s Jose Maria Olazábal believes Nick Faldo will be remembered as one of the giants of the game. But in answering questions on-line from readers of the Spanish sports daily Marca.com, the 2012 Ryder Cup captain confessed that the six-time major winner had a serious communication problem with his troops at Valhalla in 2008. José Maríia Olazábal and Sam Torrance. 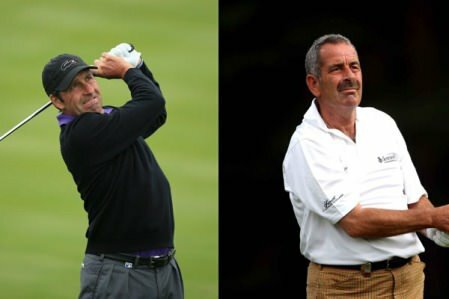 © Getty ImagesDarren Clake and Thomas Bjorn might have Ryder Cup captaincy ambitions but current skipper Paul McGinley has gone for two men he thoroughly respects in naming old hands José María Olazábal and Sam Torrance as captains for October’s Seve Trophy presented by Golf+.